At Dave and Amy English School, we feel blessed to have many high achieving students. While we would love to take ALL the credit, we owe our students and their parents a debt. Their extra work at home sets the stage for success in class. 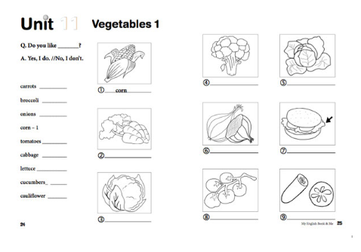 Below is the English translation of what we give to new Kindergarten Students. It explains our lessons, the texts, the homework and what parents can do to ensure success. Here is the Japanese translation. 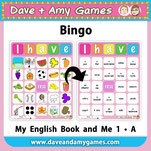 Thank you for joining Dave and Amy English School. My English Book and Me 1 and 2 are black and white picture dictionaries. Students learn vocabulary and simple questions and answers. In class we study the vocabulary, questions, answers and phonics through games and flashcards. At home, use the text to remember the vocabulary and practice the conversations. 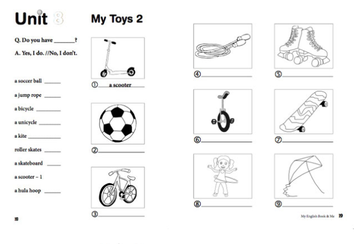 How do students practice the vocabulary, conversation and phonics in My English Book and Me 1 and 2 in class? 2. Flashcards: Our original flashcards show EVERY word in the texts with the question and answer on the back. Students look at the picture and ask and answer the questions. In class, we will mix up the flashcards—-so students are either learning for the first time or reviewing. 5. 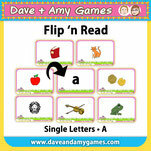 Flip ’n Look: our original game uses the same vocabulary at the texts. 6. Phonics: we use the games and flashcards for My English Book and Me: Elementary 1 before beginning that ABC text so children can recognize all letters, know their sounds and be able to think of 3 or 4 words that begin with that letter BEFORE writing. Some students even level up to the CVC games used with My English Book and Me 4 BEFORE writing begins. Children challenge themselves because they enjoy leveling up and enjoy learning thoroughly. 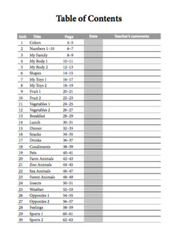 Your teacher will write the homework in the table of contents of My English Book and Me 1 and 2. She will write the date next to 1 unit. We suggest 1 unit a week. But if you would like 2 units a week, please tell us. If your child can answer correctly with little or no help, the teacher will put a check next to the picture. If your child struggles / other children or the teacher helps, the teacher will circle the vocabulary. If there are many circles (lots of unknown words) the teacher will write one more time next to the same unit in the table of contents. Please study the same unit. If the child remembered the vocabulary well, then the teacher will write good / great… next to the unit and assign the following unit for homework. Most students remember the words in 1 unit / week and progress quickly through the text. Other students need more time. On average, the text will completed in 1 year or less. Homework: Remember the vocabulary AND…. What else can you do (optional)? 2. 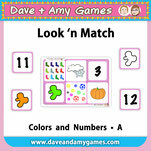 Write: write the words under the pictures and / or write the numbers next to the words. 3. Speak: practice the simple conversation as you learn the words. Do you like carrots? Yes, I do. What’s your favorite vegetable? I like __________ . Believe it or not, your child is on the way to becoming bilingual. If you have any questions at anytime, feel free to contact us.